Feb. 24, 2015, 3:06 p.m. It was not our intention, however, to create a platform just for “long-form” content or where people feel intimidated to publish if they’re not a professional writer or a famous person (something we’ve heard many times). We know that length is not a measure of thoughtfulness. The quality of an idea is not determined by the polish of the writing. And production value does not determine worthiness of time investment on the web any more than it does at the movie theater. We also know that sometimes you need to get a thought out in an incomplete form in order for it to grow — by bumping into other brains and breathing in fresh air. That’s why, today, we’re making some pretty big changes to how Medium works and feels. Venture-backed sites like Medium need lots of content and lots of users. While being known for free, elegant, digital publishing has worked for Medium so far, it hasn’t brought the hockey-stick user base growth that early investors typically seek. 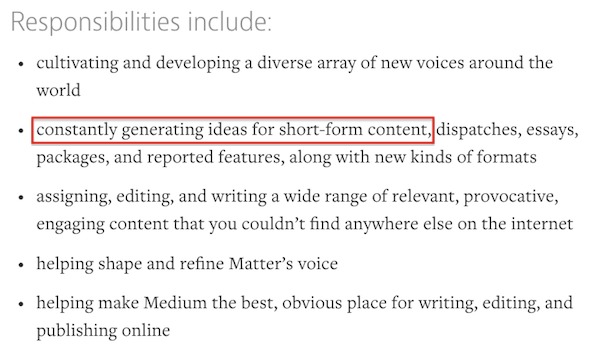 It’s also worth noting that Matter, the digital science magazine that Medium bought and turned into a sort of flagship for what it’s possible to build on Medium, is currently filling a senior editor position that reflects this pivot. By showing that Medium can be a destination for both the long and the short, the high brow and the low, the goal is to lower the stakes and get more fingers tapping away on Medium.com. O'Donovan, Caroline. "Medium, known for going long, wants to go shorter." Nieman Journalism Lab. Nieman Foundation for Journalism at Harvard, 24 Feb. 2015. Web. 18 Apr. 2019. O'Donovan, Caroline. "Medium, known for going long, wants to go shorter." Nieman Journalism Lab. Last modified February 24, 2015. Accessed April 18, 2019. https://www.niemanlab.org/2015/02/medium-known-for-going-long-wants-to-go-shorter/.